EVENT: VINITALY 2019 Verona (Italy)- April 7-10; Come and meet us in: Pavillion 11_ stands E5-F9 (Regione Basilicata Expo Area). Click here to learn more. EVENT: RASPIPAV _October 27th-30th: thanks to our buyer based in Quebec_Canada, Cantina Madonna delle Grazie will partecipate at “Le Salon de Vin d’importation Privée, 11th edition in Montreal and Quebec City. Clik here and here to learn more. EVENT: AROMI TERZIARI presents: “Aglianico vs Nebbiolo”, wine testing and dinner with CantineMadonnadelleGrazie, c/o Marezer Restaurant, Brückenstrasse 12, 3005 BERN CH - September 22/2018 - 6:30 p.m. Click here to learn more. “Wine and Dine with Cantine Madonna delle Grazie” at Golf Limpachtal Restaurant, Unterdorfstrasse 8, 4587 AETINGEN CH - September 21/2018. My family has farmed the vineyards in the village of Venosa since the beginning of the 1900s. For decades, we sold the grapes and wines exclusively to locals and cooperatives in the area. It wasn't until 2003 that I realized the great potential of old, indigenous aglianico grapevines, which are grown in the volcanic soils of Mt. Vulture, an ancient extinct volcano. Along with my wife and sons, I built a new winery near the 16th century Madonna delle Grazie monastery on the hills that surround Venosa. We decided to bottle our first vintage wine with the name "Cantine Madonna delle Grazie". Today we work a 8.5 hectares of vineyards all planted with the aglianico grape variety. We take great care to both respect and nurture the unique ecosystems of these hills, which rise to an elevation of 400 to 500 meters. Cantine Madonna delle Grazie is our work, our life and our home. I am very proud that after I'm gone, my sons will continue the traditions, values and the culture of our ancestors, producing wine with a deep and genuine respect for the environment. A double name (Basilicata and Lucania), a double sea (Tirreno and Ionio) and the doubled value of history and nature, bounded together, make Basilicata a unique region of Italy. Vulture, the ancient volcano, stands as a witness of the long history of this place. It's volcanic activity (from about 2.500.000 to 300.000 years ago) has generated two scenic lakes (the Monticchio natural settlement) and determined the mineral and pedagogical characteristics of the territory. It's grounds are still the perfect, fertile environment for grape growing. At the bottom of Mt. Vulture, sits the Roman city of Venosa, home to the poet Horace (from 1st century BC), who famously wrote the phrase "Carpe diem". 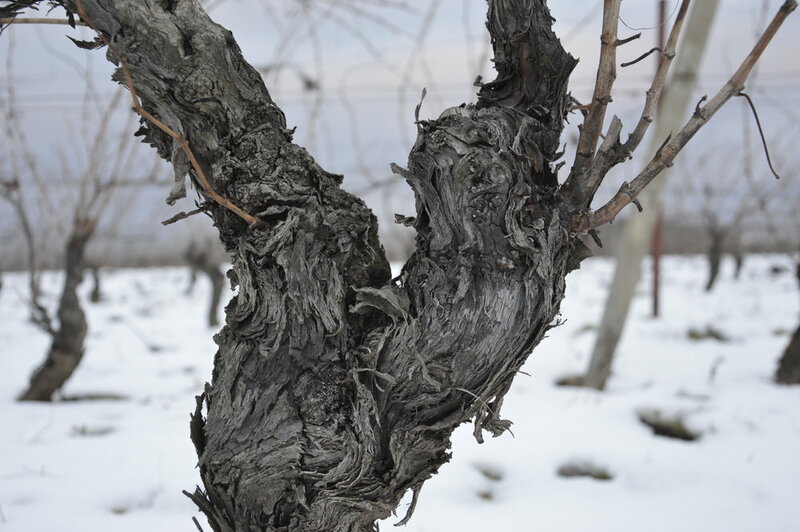 We are proud custodians of beautiful old vines. At Madonna delle Grazie winery we do not use pesticides, insecticides or herbicides. We focus on small and individual parcels of aglianico vines and more recently we've explored the strengths of the Vulture area by making a rosè and a blanc de noir aglianico. In every vintage we are keen to understand the uniquely character of our wines produced from individual blocks of vineyards where the age of the vine and diversity of soil play a very important role. To respect the identity of the grape we minimize the amount of interventions throughout wine making process. Our policy of minimal intervention allows the wine to progress naturally. Our aim to make wine that has grace and intrigue, and we love to enjoy it with food. Sunday 10:00 AM TO 1:00 PM. Tastings are welcome by prior arrangement. Please contact us by email, phone, or the form below.